President Trump has been in office for more than a week and has taken advantage of his executive powers by beginning to craft and impose his administration’s policies. Seven days into his first term, Mr. Trump issued more than a dozen executive actions, which include a government-wide freeze on new and pending regulations, the reinstatement of a policy that bars U.S. funding to health providers abroad that discuss abortion as an option and a call for the construction of a physical wall along the U.S.-Mexico border. The one that has provoked the loudest uproar was the travel and refugee ban, which blocks people from entering the U.S. from seven predominantly Muslim countries and halts admission for Syrian refugees. Most of the actions taken so far are technically presidential memoranda, while some are executive orders, which have the force of law and must be published in the Federal Register. Historically, presidents have embraced the executive order as a tool to use when there’s a lack of action from Congress. Some have been infamously contentious -- President Franklin Roosevelt signed one in 1942 that established internment camps during World War II. What happens when Trump signs executive action on Mexico border wall? Within hours of being sworn in a week ago, Mr. Trump signed his first executive order, which seeks to “minimize the unwarranted economic and regulatory burdens” of the Affordable Care Act (ACA). The Trump administration could change rules related to Obamacare, Peterson said, that were developed as part of the regulatory process. He pointed out, however, that any new, proposed regulations would have to comply with existing law and would be subject to a lengthy and complex process that would take months to implement them. Robert J. Blendon, professor of health policy and political analysis at Harvard’s School of Public Health, agrees that the order itself is not going to affect many people, but it does have enormous significance politically. “If I am a governor, a president of an insurance company, I’m somebody enrolling, I’m saying I don’t know what this thing does, but this is a signal that this new president places as job number one, getting rid of this law,” he said. The talking points given to Congress by the White House said that one goal of this executive order was “to help get the mandates and penalties off the backs of the poorest and sickest Americans.” The ACA’s individual mandate requires that Americans purchase health care insurance or pay a penalty. But this provision was already somewhat weakened by the fact that the law gave the IRS no real ability to enforce the payment of the penalty. The only recourse the tax collecting agency has is to subtract the penalty from the taxpayer’s refund. And if the taxpayer isn’t entitled to a refund, the IRS can carry the penalty over to the following year. Mr. Trump signed an executive order Friday that has blocked people from entering the U.S. from seven predominantly Muslim countries: Iraq, Iran, Syria, Libya, Yemen, Somalia and Sudan. The order also suspends the Syrian refugee program to accept new refugees into the U.S. for 120 days. The order for called the extreme vetting of new arrivals to the United States. 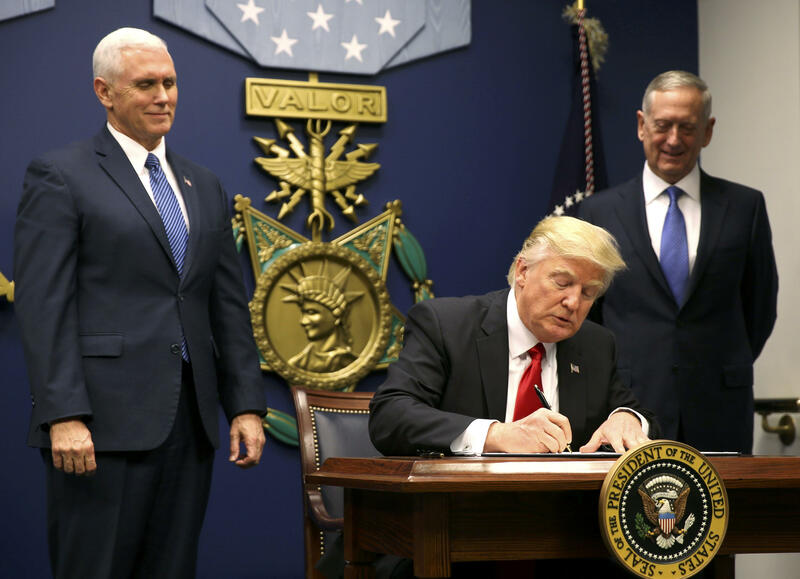 “I’m establishing new vetting measures to keep radical Islamic terrorists out of the United States,” he told an audience at the Pentagon, where the action was signed. His order directs the State Department to stop issuing visas to Syrian nationals and halts the processing of Syrian refugees for 120 days. The president, during his signing of the order at the Department of Homeland Security, also called on the Pentagon and the State Department to create a plan for safe zones in and around Syria to offer protection for Syrians fleeing the war there. But the signed order itself makes no mention of a plan for safe zones in Syria. A draft of the order had directed the Pentagon and the State Department to produce a plan for safe zones in the war-torn Mideast nation. Mr. Trump ordered a 120-day suspension of the U.S. Refugee Admissions Program, which is America’s broader refugee program. The suspension is intended to provide time to review how refugees are vetted before they are allowed to resettle in the United States. The executive action appears to be capping the number of refugees from other countries at 50,000 people in fiscal year 2017, saying more than that “would be detrimental to the interests of the United States.” The Obama administration had set a goal of admitting 110,000 refugees into the U.S. in the current fiscal year, which began last October. But it won’t be that simple. Philip Schrag, a Georgetown law professor whose expertise includes immigration policy, said the U.S. doesn’t own all of the land adjacent to the border. “In Texas, apparently there are a great many of the lands adjacent to the border in private hands, so the government would first have to seize the land by eminent domain or purchase it from the owners and then deal with the construction problems,” he said. The order also calls on the DHS secretary to identify and allocate funding for the wall’s construction and prepare long-term budget requests to submit to Congress. House Speaker Paul Ryan is already on board and ready to work with the president to fund the wall. Mr. Trump also called for the hiring of 5,000 more Border Patrol agents and the construction of detention facilities near the U.S. border with Mexico, although that is dependent on Congress allocating money for the hires. Schrag added that the migration of animals along the border will also pose an obstacle to building the wall and the U.S. will have to spend years funding this project. “The challenges of building a physical wall in that terrain are going to mean that this is an extremely expensive project, requiring billions of dollars of appropriations over a period of years,” he said. Mr. Trump signed another executive order Wednesday that intends to allow the attorney general and homeland security secretary to make a determination whether certain cities, known as “sanctuary cities,” are not eligible for federal grants. Schrag, however, said that the order doesn’t make sense because it says states and cities can’t receive federal grants if they willfully refuse to comply with the law, U.S. Code 1373. The order also says the DHS must prioritize deportations for people in the U.S. illegally who have been convicted of a criminal offense, have been charged with one, have engaged in fraud and abused any program related to public benefits, among other criteria. It also calls for the hiring of 10,000 more immigration officers, which Congress would have to agree to allocate funding for. Many mayors are resisting the threat posed by the executive order, though not all. Fearing a loss of millions of dollars from the federal government, Miami-Dade Mayor Carlos Gimenez ordered county jails to begin complying with federal immigration detention demands. The move effectively unravels Miami-Dade’s status as a “sanctuary” for the undocumented. A memorandum Mr. Trump issued Monday imposed a freeze on all federal civilian employees “across the board” in the executive branch. On Monday, Mr. Trump issued a memorandum that reinstates the Mexico City policy, introduced in 1984 by President Ronald Reagan, which bans the granting of U.S. funding to health providers internationally that discuss abortion as a family planning option. Since the Reagan administration, Democrats have rescinded the policy and Republicans have reinstated it. The latest president’s memorandum directs the secretary of state to ensure that “U.S. taxpayer dollars do not fund organizations or programs that support or participate in the management of a program of coercive abortion or involuntary sterilization.” Democrats have called the policy a “global gag rule” and have blasted the president for taking this action. “President Trump’s reinstatement of the Global Gag Rule ignores decades of research, instead favoring ideological politics over women and families. We know that when family planning services and contraceptives are easily accessible, there are fewer unplanned pregnancies, maternal deaths, and abortions,” said Sen. Jeanne Shaheen, D-New Hampshire, in a statement. Mr. Trump issued a memorandum Monday that called on the U.S. Trade Representative to pull out of the Trans-Pacific Partnership (TPP) and negotiations that began under President Obama. It was largely a symbolic move since Congress had no plans to approve the trade deal. “I hereby direct you to withdraw the United States as a signatory to the Trans-Pacific Partnership (TPP), to permanently withdraw the United States from TPP negotiations, and to begin pursuing, wherever possible, bilateral trade negotiations to promote American industry, protect American workers, and raise American wages,” the memorandum says. On Tuesday, the president signed memoranda that attempt to renew the process for the construction of the Keystone XL pipeline, which was halted by Mr. Obama, and the construction of the Dakota Access pipeline. For the Keystone pipeline, the action invites TransCanada to “re-submit” an application for a presidential permit for the construction and operation of the pipeline that would carry petroleum from Canada into the U.S. The memorandum on the Dakota Access pipeline called it a “substantial, multi-billion-dollar private investment in our nation’s energy infrastructure” and would carry about 500,000 barrels of crude oil from different areas in North Dakota to oil markets in the U.S. The Army Corps of Engineers announced in December that it would explore an alternate route for the pipeline after the Standing Rock Sioux tribe said the pipeline interfered with their drinking water, which led to massive protests. White House chief of staff Reince Priebus said in a memo last Friday that he was communicating a request from the president to the heads of all government agencies that no new regulations could be submitted to the Federal Register until the head of a department or agency, selected by Mr. Trump, can review and approve the regulation. Any regulations that were already sent to the Federal Register must be immediately withdrawn for review and approval. For regulations that have been published in it, but haven’t taken effect, their effective date must be postponed for 60 days to review them. “As we prepare our budget request for Congress,” he said, “... our military strength will be questioned by no one,” but neither will the nation’s commitment to peace. “We will always have your back,” he vowed to an audience at the Pentagon. According to Mr. Trump, the new action will provide new planes and ships for the military, along with resources and tools for the nation’s men and women in uniform. Mr. Trump signed an executive order Saturday that bans administration officials from ever lobbying the U.S. on behalf of a foreign government again and imposes a five-year ban on people lobbying the agency they previously worked for. Another part of the order said that for two years, appointees must avoid working on issues involving their former clients or employees. A second week into his presidency, Mr. Trump signed an executive order that requires that two regulations be removed for every new regulation added. The White House argues that this will reduce the burden the private sector has in complying with federal standards. CBS News’ Emily Schultheis and the Associated Press contributed to this report.